For Craig Glidden of General Motors Co. dedication to a career in law is all about finding possibilities and building opportunities. 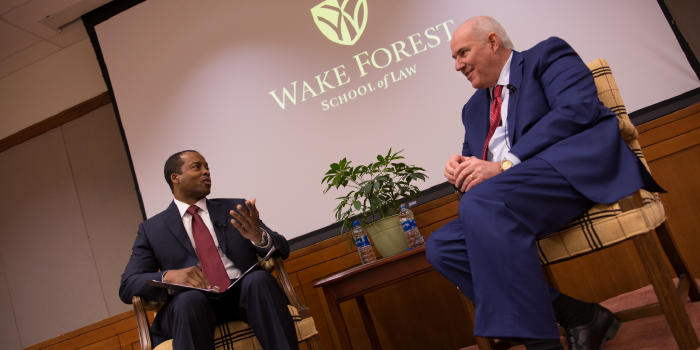 “The most memorable part of law school was how it opened up my mind to the possibilities of what could happen in my life,” says Glidden, executive vice president and general counsel of General Motors Co., told a group of Wake Forest School of Law students, faculty, staff and alumni on Feb. 6, 2018, during an interview with Professor Omari Simmons. The event, co-sponsored by the Business Law Program (BLP) and Business Law Society, was part of the distinguished Sager Speaker Series. These possibilities, though not always visible to Glidden, were discovered from the humbling experiences and opportunities that law school often affords its students. Through long hours at the law school library, Glidden learned that mastering a skill took a lot of extra time and effort. He would soon discover that developing skills to practice law was no different. Glidden has been recognized and rewarded throughout his career for his ability to perfect the fundamental skills required for a given task. But in light of these successes, Glidden has also had to learn to pivot, adapt and embrace changes and challenges within his environment. “My career hasn’t been me pointing and wanting to go somewhere, (but) more has been me doing the best job I can in the job I’m in and an opportunity opens up as a result,” Glidden explained. Glidden joined General Motors Co. in his current role in March 2015 following a series of lawsuits in 2014, which involved a defective ignition switch. Although Glidden has contributed to a variety of the company’s innovative achievements, his job constantly tests his ability to balance a series of diverse and conflicting variables simultaneously. As general counsel, Glidden said his primary concern is to make sure that the company’s best interests are at the forefront of all business decisions. The general counsel steps in as the companies trusted advisor and guardian of the company during times of stress. Although Glidden primarily works with the CEO, board of directors, and the executive team, he emphasizes the importance of balancing these powerful members’ trust, while also remaining loyal to the company as a whole. Glidden believes strongly in the in-house profession, knowing that in-house legal departments fill the role of intermediaries between private law firms and business executives. “There is an art form in knowing that you represent the company, but also letting everyone else know that you are there to partner with them to create value,” Glidden said. This value is achieved through intimate knowledge of the business as well as legal acumen. Lawyers must learn to combine these two variables to provide solutions and guide their clients in the best possible direction, Glidden added. Glidden further emphasized the need to balance both “long-termism” and “short-termism” when dealing with shareholders. A good lawyer must learn to make short-term investments that will positively affect the company’s stock in the long-term. While this insight seems intuitive, Glidden expressed this trade-off is one that often frames the most difficult decisions within every company. The combination of these variables, as well as everyday obstacles, push Glidden to be the best lawyer that he can while also challenging him to maximize customer and company benefits. Watch a video of this event at youtu.be/yP7TWJUBJf8.